As anyone that reads this blog knows, Dave has a huge appetite. It is a major undertaking to keep him fed with relatively healthy food, and not go broke, or not spend 10 hours a day cooking. One of his favorite food is tacos. I have a really fast way to make a big bunch of tacos, with very little effort. 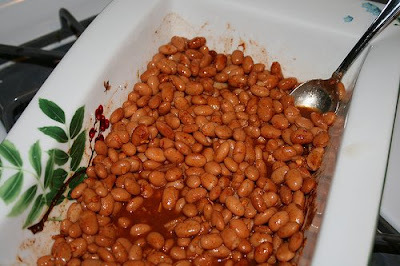 First, I put 2-3 cans drained, rinsed pinto beans in a casserole dish. Then, I add the seasonings, and just a bit of water. For the seasonings, I use: chili powder, cumin, hot sauce, salt, onion powder, and pepper. You could use a pre-packaged taco seasoning mix and it would work just as well. The seasonings are really determined by your own tastes. On top of the beans I add some thinly sliced red onion, some diced fresh tomatoes, and some black olives. If you eat cheese, you can add some shredded cheddar or jack. I bake the casserole in a 350F oven until everything is bubbly and the cheese is melted. 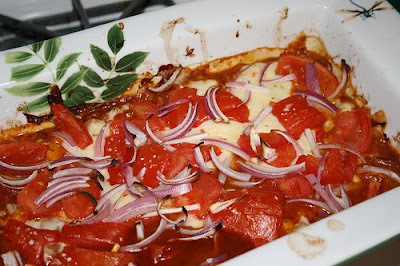 Let the casserole cool a bit before serving, and keep it covered during dinner so that it stays warm. 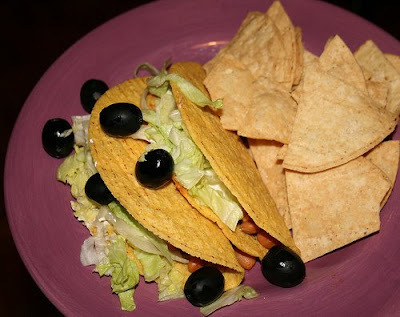 To serve: I set out a platter of extra olives, shredded lettuce, avocados, and sour cream, along with taco shells and tortillas. People can just help themselves to the taco filling and toppings, and everything will stay nice and warm. Leftovers are simple to re-heat, just pop the casserole back in the oven for a few minutes.